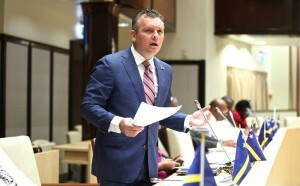 WILLEMSTAD - The opposition party of former Prime Minister Gerrit Schotte, MFK also wants foreigners older than 18 to vote for during parliamentary elections. An initiative bill has been submitted for this purpose. The foreign national must have been born in Curaçao or have a permanent residence permit here. In order to change this, not only the electoral regulations but also the Constitution of Curaçao must be adjusted. This will require two-thirds of the vote in parliament.